What can I say! Sometimes when you least expect it you find the most interesting sodas ever. On my way to an eye doctor’s appointment and Vietnamese Pho Restaurant for lunch I saw a big Faygo beverage cooler beacon calling my name. Now it wasn’t the glass bottles I wanted but to be able to try an item I been looking for a long time, I’ll survive. 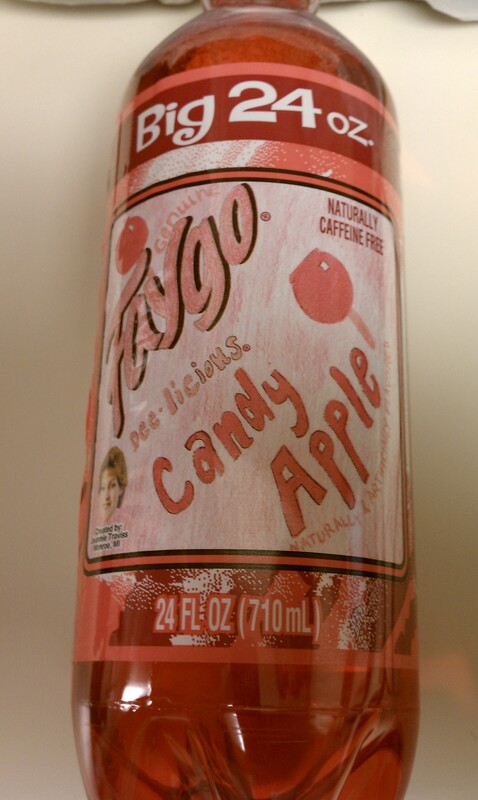 Faygo is bottled and distributed from the proud state of Michigan. This particular flavor is actually a very rare find. It was fan submitted to a contest and Jeannie Traviss won and got her flavor candy apple chosen. Candy apple has risen to an almost cult like status because it has been discontinued and reintroduced at a moment’s notice. The color is definitely candy apple red. This 24oz bottle smells great upon opening it; the sweet apple smell is something new. The flavor is even more unique, it tastes exactly like a caramel apple to me. I truthfully have never had a candy apple so I don’t know if it perfectly matches that, but it reminded me of a candy I used to get as a kid, Tootsie Roll caramel apple pop. It is average in terms of carbonation and is extremely sweet; one bottle will give you one heck of a sugar buzz. The thing this flavor had going for it was its uniqueness. This stand out flavor may become someone’s new flavor cult underdog, for me it’s a conversation starter for sure to have a place in my refrigerator if I can find it again.